Oil on panel, 82 x 70,5 cm. 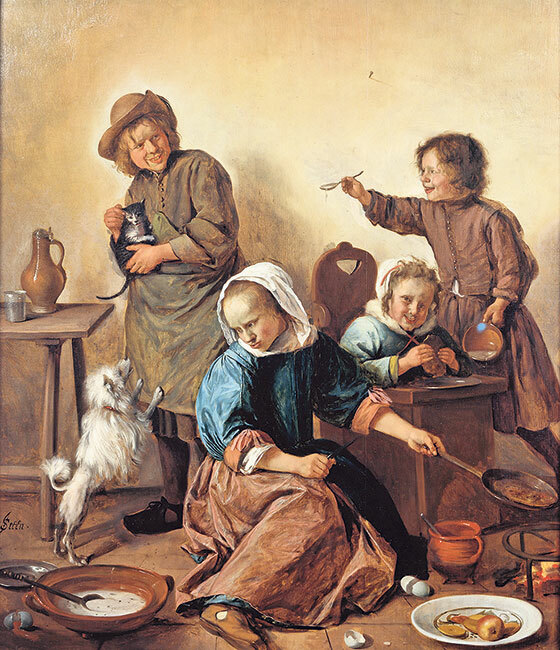 The Dutch call a disorderly home such as this a “Jan Steen household”. The children are presumably the artist’s own, and their questionable behaviour should serve as a warning against waste of God’s gifts. The work is humorous, a parody of a proper and honest family life. There is a great richness in detail in the foreground and middleground, while the wall in the background is stark, adorned only with a single, bare nail. In addition to the painterly qualities of the work, the unruly atmosphere is a good example of the everyday intimacy reproduced in Dutch art. Johannes Hage was not a conformist in his views on family, children and relationships, and in that sense, the painting has resounded well with his overall view on life.